It’s been quite the week for incredible game launches for the iOS devices. We saw the release of Infinity Blade, which quickly became the highest grossing app of all time in a mere 4 days. Now, one of the most anticipated iOS games of the year, Real Racing 2 is now out in the App Store. What makes this launch so spectacular is that Real Racing 2 features 30 licensed cars–something that rarely happens in the budget for a game made for your phone! Get ready for the most exhilarating handheld racing experience! Take control of 30 officially licensed cars, each with unique performance characteristics. Feel the thrill of authentic pack racing action in an incredible 16-car grid â€“ the first on iOS! â—† Get to know meticulously detailed cars including the 2010 Ford Shelby Mustang GT500, 2010 Nissan GT-R (R35) and 2011 McLaren MP4-12C. See the full list at http://firemint.com/r2. â—† Enjoy well over 10 hours of gameplay in the massive career mode with time trials, head-to-head races, eliminations, single â€˜cupâ€™ races, qualifiers and championships. Win races to purchase new cars and feel the difference with performance upgrades that affect handling. Work your way up from rookie to pro, or just jump into a Quick Race for instant fun. â—† Find out who the real champion is! Enter auto-matched 16 player online races. Meet up with friends for 8 player local WiFi races. Compete on global leaderboards in Time Trials. â—† Race in 15 beautiful locations, with 40 miles of highly detailed race tracks, speedways and city circuits including twilight and night races. â—† Choose control options to suit your personal style. Earn the checkered flag with our intuitive and easy to master controls or take things up a notch by disabling all driving assists. Set anti-skid, steering assist and sensitivity, automatic or manual acceleration and brake assist level. Touch or tilt to steer. â—† Cutting edge graphics and physics powered by Firemintâ€™s exclusive high performance Mint3Dâ„¢ engine – optimized to push OpenGL ES2 and retina display technology to the limit, and fine tuned for the best experience on older devices. 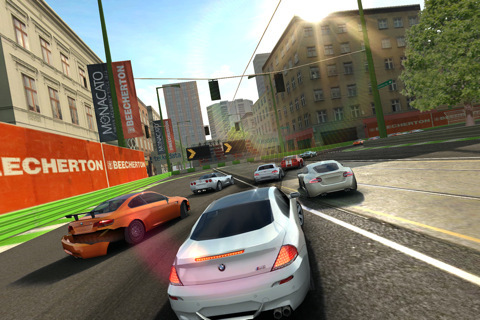 I’m a huge fan of racing games and I look forward to testing out Real Racing 2. It’s $9.99 in the App Store but it’s well worth it for the multiplayer, graphics, and the ability to drive licensed cars from companies such as BMW, Lotus, Jaguar, Mclaren and more. This is the closest thing to Gran Turismo on your iPhone. 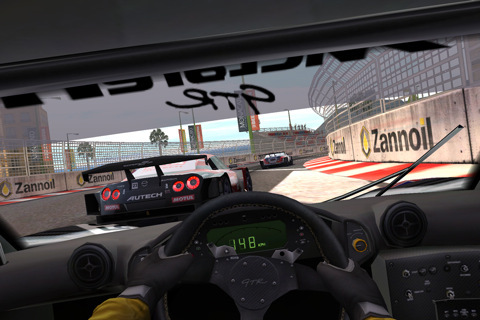 Will you be picking up Real Racing 2? Click here to download Real Racing 2.